The question might be phrased like this – do I read for fun anymore? Some days it seems I do not any longer. Back when I was a student – a BSc student, then a PhD student – I found myself reading an awful lot of geology-related books… not just for study, but for the fun of it. Indeed, some of my teachers observed I was reading too much geology, and getting strange ideas, like this was the ’80s or the ’90s and not, as they seemed to believe, 1958. And ever since I started working seriously on my writing, I also started reading a lot of stuff which is great fun indeed, but can still be filed under “research”. 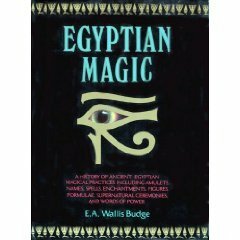 Case in point – I’m reading Egyptian Magic, by the venerable E.A. Wallis-Budge. Wallis-Budge was for a long time the leading authority on Egyptian magic and religion, and I’ve got a few books of his – including a wonderful thing that’s called The Mummy: A Handbook of Egyptian Funerary Archaeology. As I said, this is actually fun reading… no, really! And yet, it is obvious I’m also reading Wallis-Budge’s book on Egyptian magic to pick up a few ideas to spice up Amunet’s bag of tricks. Writing her character, two factors are important – I’m to make her magic… magic, and I’m to make her magic as Egyptian as possible. Up to date, I ask? About what? The latest developments in Egyptian demon summoning? No, I know, I know… archaeology is shedding new light on ancient practices every day but, frankly, I do not care that much. Yes, I know his translations are bad (as pointed out, famously, in the movie Stargate), but I’m writing fantasy, not a handbook for enchantresses, so it’s all right if I stick with Wallis-Budge’s late Victorian views on Egyptian magic. It’s research for pulp-style adventure, so it’s all right if it’s old and outdated, and melodramatic and biased. With its silly class-system biases, its unlikely parallels between Egyptian “monoteism” and Christianity, its tut-tutting at superstition and all the rest, Egyptian Magic is a perfect period piece – this is a sum of what Indiana Jones would have known about Egyptian magic, this is the sort of book Sexton Blake had in his library, and which was the standard reference for courses in Metaphysics in Miskatonik U. Not only it gives me flavor – which is what I’m looking for – for my sword & sorcery stories, but I could recycle it for other tales! So, to me, Walis-Budge’s book is perfect: fast, cheap, well-written. I have enough Egyptology to get a good laugh here and there, and yet, with this booklet I have a one-stop resource for my storytelling. And I’m having fun – despite this being research. So maybe yes – I still do read for fun. Categories: Pulp hero's library | Tags: Amunet, Book, E. A. Wallis Budge, Egyptian Magic, Egyptology, Indiana Jones, Sexton Blake, Wallis-Budge | Permalink. You know I love her and this book sounds very interesting but I won’t read it because I don’t want to be influenced. Can’t wait to read what Wallis-Budge’s work inspires you.